If you’ve ever been on the Gulf Coast on a humid summer night just after dusk, you may have noticed clouds of insects swarming every light source, buzzing around faces, and crunching underfoot. These winged creatures haunting the coast are not moths or mosquitoes, but Formosan termites, an invasive pest that causes millions of dollars of damage every year. In the face of these swarms, residents can do little but shelter inside and think fondly of the days before these ravenous insects were accidentally introduced by soldiers returning home from the Second World War. Formosan termites are one of the most spectacular examples of an invasive pest, and a strong argument for warehouse pest control throughout the supply chain. To prevent other invasions of this kind, the World Trade Organization (WTO) adopted International Standards for Phytosanitary Measures (ISPM), which regulate the transportation of plants and plant material. ISPM 15 governs wood packaging, including pallets, and requires that wood pallets be treated in a manner that prevents infestation and the transfer of insects and other organisms as they move through the supply chain. However, ensuring that wood pallets are properly treated is an extra expense and hassle for manufacturers and distributors, who may instead wish to bypass ISPM 15 by using pallets made of a material besides wood. ISPM pallets made of alternative materials don’t require treatment and won’t harbor wood-eating insects. What Is an ISPM Pallet? The most stringent requirement ISPM 15 sets forth is that all wood packaging materials must be debarked before treatment, regardless of what sort of treatment is planned. This does not specify the complete removal of bark, as anyone who has handled wood pallets will be aware. It’s common to discover large pieces of bark on wood pallet boards that still have the contours of the tree’s trunk. ISPM 15 allows visually noticeable pieces of bark if they are less than three centimeters in width, with any length, or are greater than three centimeters in width, as long as the total area of bark is less than 50 square centimeters. 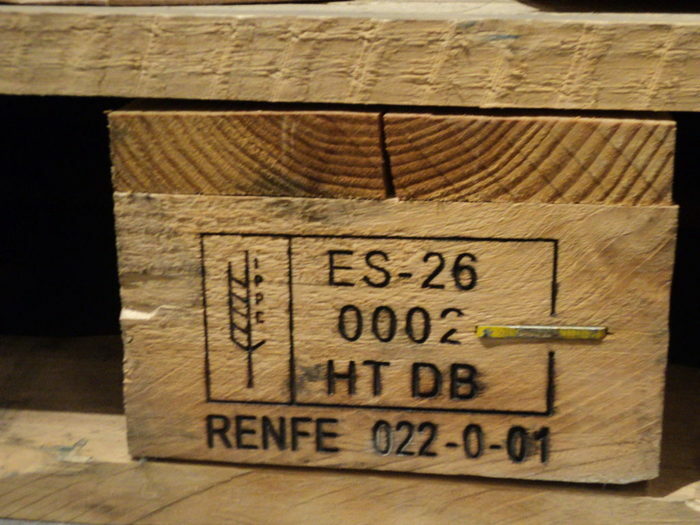 Once the wood has received heat or chemical treatment, it is stamped with a two-part ISPM marking, often called a wheat stamp. Steady Heat Treatment: This is the standard heat treatment used to prepare pallet wood. Debarked lumber is placed into a chamber that is then heated to the required temperature and held at that temperature for the required amount of time. Kiln-Dried Treatment: Just as in the previous process, kiln drying involves heating lumber in a chamber. However, in this procedure, the moisture is also carefully controlled and measured. This is the same process used to produce lumber for use in a home’s interior. Mobile Heat Treatment: A specially built chamber on the back of a truck allows heat treatment to take place anywhere, though this method has the disadvantage of only being able to treat limited quantities of lumber. Container Heat Treatment: This method involves heating the lumber in a shipping container, and is used at the port prior to transporting the wood packaging. Container Fumigation: In this method, debarked lumber is placed into a container and the container is then completely filled with methyl bromide gas. After 24 hours, the container is opened, the methyl bromide is allowed to dissipate, and the lumber is removed. Tent Fumigation: The tent process for methyl bromide fumigation is the same as container fumigation except that a sealed tent is used. This allows greater mobility and enables larger batches of wood to be treated at the same time. Once the wood has received heat or chemical treatment, it is stamped with a two-part ISPM marking, often called a wheat stamp. The marking contains a two-letter ISO country code, the identification number of the regulatory agency that oversees the wood manufacturer, and a number identifying the manufacturer. It also contains a two-letter code identifying the treatment type–HT for heat treatment or MB for methyl bromide. Heat is by far the preferred treatment type for pallet wood since methyl bromide is toxic to humans and is an environmental hazard, which makes it incompatible with green supply chain management practices. This chemical has already been phased out for every other use except for quarantine and pre-shipment, and its continued use in these roles should be taken as an indicator of how serious the threat of invasive species is. Pallets for domestic use within a country are exempt from ISPM 15 requirements. While ISPM 15 is the global standard for the treatment of wood packaging for international trade, it does not cover every wood pallet. Pallets for domestic use within a country are exempt. Pallets traded between the U.S. and Canada are also exempt, though this exemption is slowly being phased out. Exemptions like these create issues in pallet management due to the mixing and exchange of pallets that commonly occurs in the supply chain, which make it difficult to ensure that every wood pallet complies with ISPM 15 or another applicable regulation. Changes in enforcement also add to the confusion and require that manufacturers closely follow regulations to avoid expensive violations. In late 2017, U.S. Customs and Border Protection (CBP) announced a change to the way ISPM-15 would be enforced. Whereas previously penalties would be assessed only after five violations had occurred, CBP would now issue a penalty for each violation of ISPM 15. The penalty may go as high as the full value of the goods found to be shipped with packaging violating ISPM 15, and may include seizure of those goods. This penalty not only represents both a fine and increased scrutiny by enforcement agencies, it can also put a vendor in breach of contract with retailers. 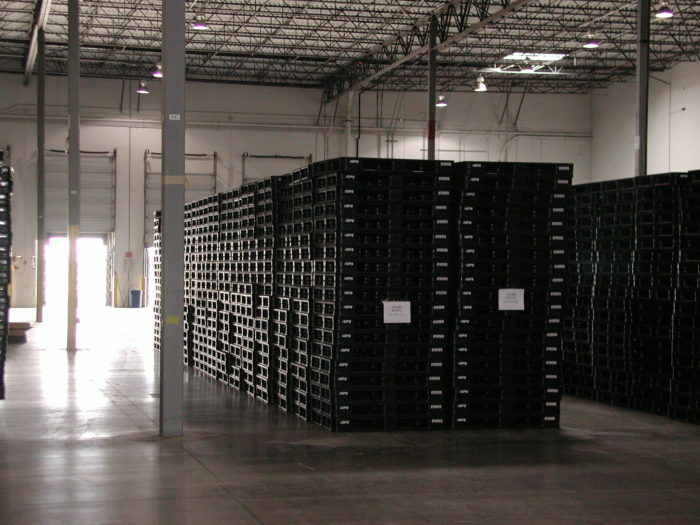 Plastic shipping pallets don’t offer insects food to eat or a place to hide, and are easy to rinse clean of dirt and liquids. Due to the fact that penalties may be applied for something as simple as damage to the pallet’s ISPM stamp, for many companies the best solution may be to dispense with wood pallets entirely and use a pallet material that is fully exempt from ISPM 15. Plastic shipping pallets don’t offer insects food to eat or a place to hide, and are easy to rinse clean of dirt and liquids. Not only are plastic pallets exempt from the requirements of ISPM 15, they also offer many other benefits, such as greater durability, a lighter weight, and better integration with automated systems. Plastic pallets are also available at a price competitive with wood pallets when they’re rented through a pallet pooling service. Choosing pooled plastic pallets ensures a supply of safe, ISPM-exempt pallets you can rely on without the need to manage your own pallet supply. The iGPS pallet pool offers a high-quality plastic rental pallet that doesn’t require heat treatment or chemical fumigation for international shipping. To use the environmentally friendly and sustainable pallet of the future, give our team a call at 1-800-884-0225, email a specialist at switch@igps.net, or visit our contact page.